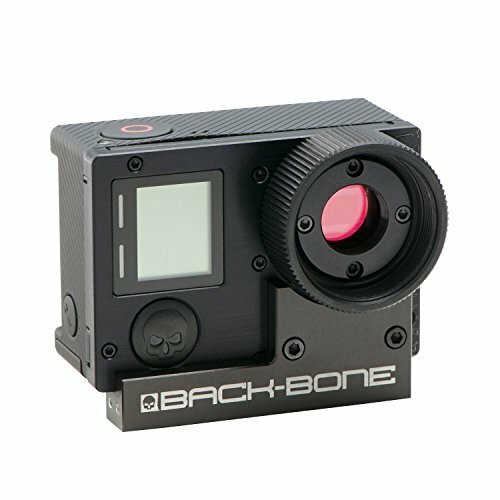 Take your action camera footage to the next level with the Ribcage Modified GoPro HERO4 Black from Back-Bone Gear. This HERO4 Black has been modified with an aluminum face plate and removable lens mount system, turning it into a compact, interchangeable lens camera. You can now select the right lens for a given shot and capture 4K Ultra HD (3840 x 2160) video at 30 fps, 2.7K video up to 60 fps, or 1080p video up to 120 fps.. The camera is compatible with widely available M12, CS-Mount, and C-Mount lenses, as well as other types of lenses via optional C-mount adapters. This lets you take advantage of all the benefits that professional lenses have to offer, including manual focus and iris control, macro shooting, increased depth-of-field, and optical zoom. The HERO4’s original ultra-wide lens is included and has been modified for use on the Ribcage. Additionally, all accessories and cables originally supplied with the HERO4 Black are included, as well as a custom GOcase for storing and carrying the camera, optional lenses, and accessories. The modified camera comes with a removable tripod mount adapter so you can use it with professional mounts and supports. Additionally, you can use GoPro’s optional The Frame mount to use the camera with GoPro-style mounting accessories. Also included are IR cut filters are which can be removed so you can see in the dark when shooting with any optional IR light source. You can even combine up to two custom 15mm filters simultaneously, such as the IR cut filter and an optional ND filter. By integrating a filter holder into the lens mount, you’ll only need filters for the camera, not all of your individual lenses. For added convenience, all of the lens mounting rings are removable for easy filter replacement and sensor cleaning.